We can’t wait to start planning this year’s Halloween party and we already gathered a nice pile of ideas that we’d like to take inspiration from. 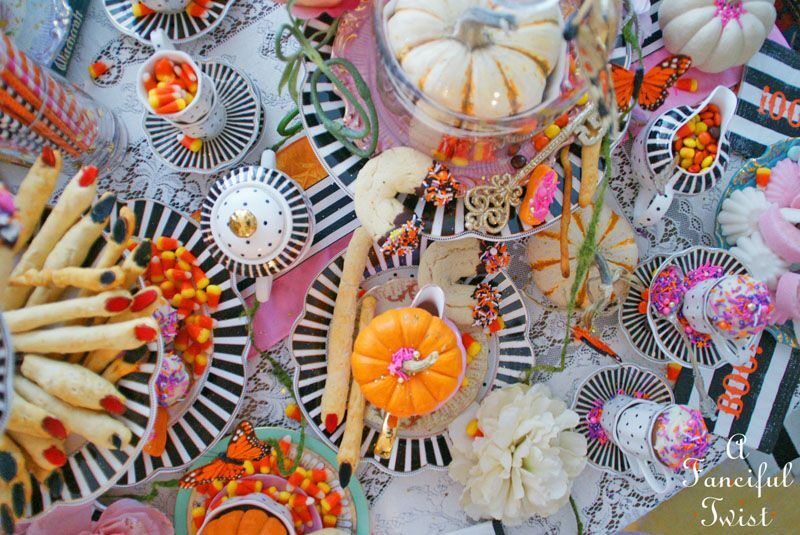 Of course, we’ll share these ideas with you in the hopes that you too will feel inspired and will plan awesome Halloween party full of beautiful decorations. 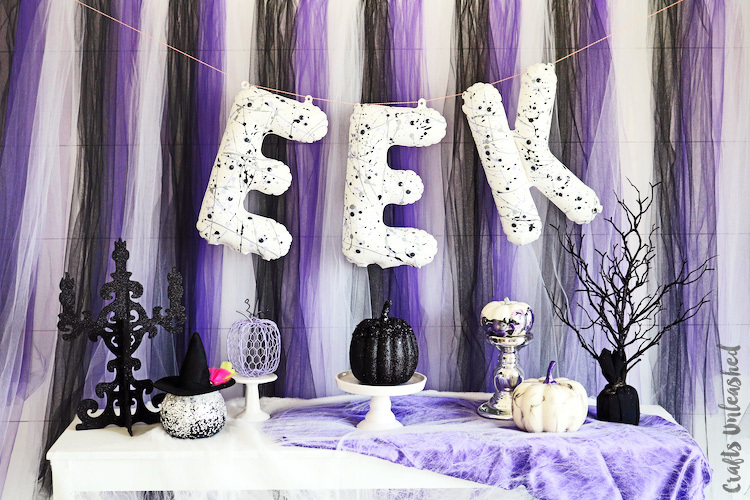 This Halloween party backdrop is definitely designed to impress. We love the eye-catching and trendy colors and also the fact that this is actually a fairly easy DIY project. To make something like this you need tulle rolls in purple, white and black, acrylic paints, google eyes, twine, letter balloons and glue. You can find all the necessary details on consumercrafts. 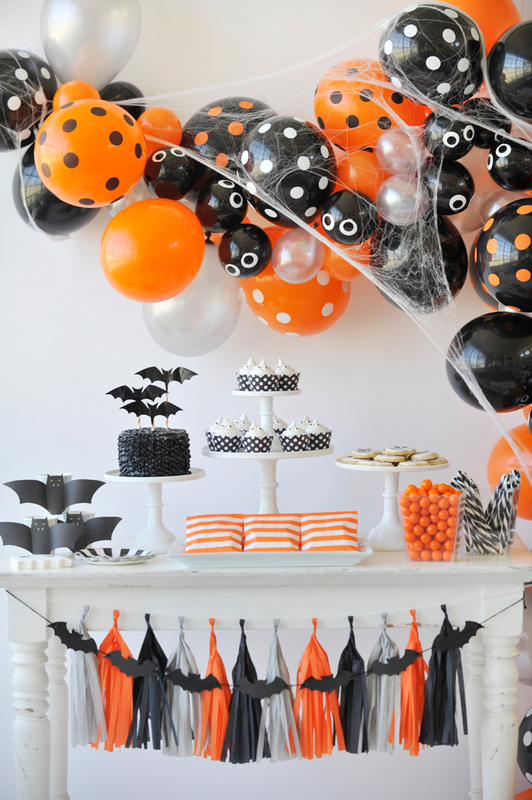 Balloons are incredibly versatile and you can use them in a lot of ways to make your Halloween party decor a big success. For example, you could make a balloon garland. You can use orange and black balloons and you can make some look like cute spiders. Check out this awesome display featured on eighteen25 for inspiration. 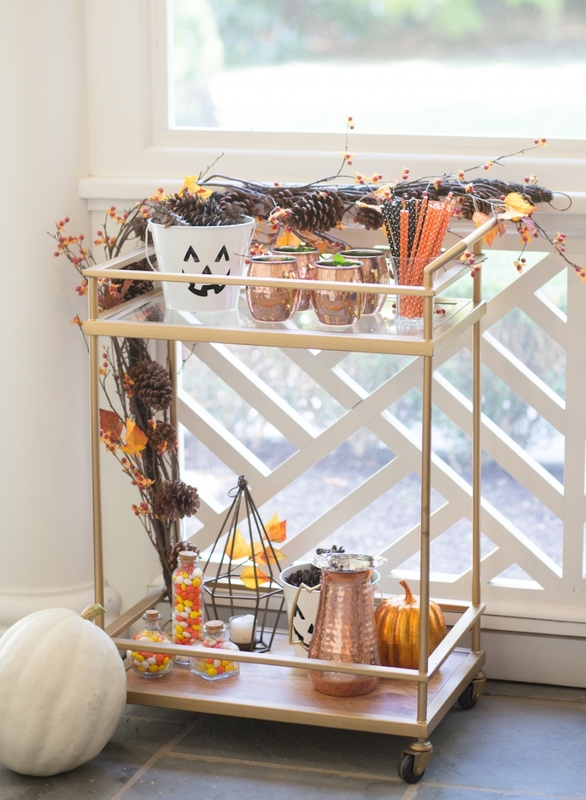 Prep a bar cart and make it look spooky with a cute twist. Bar carts are very practical at parties and can be easily customized. 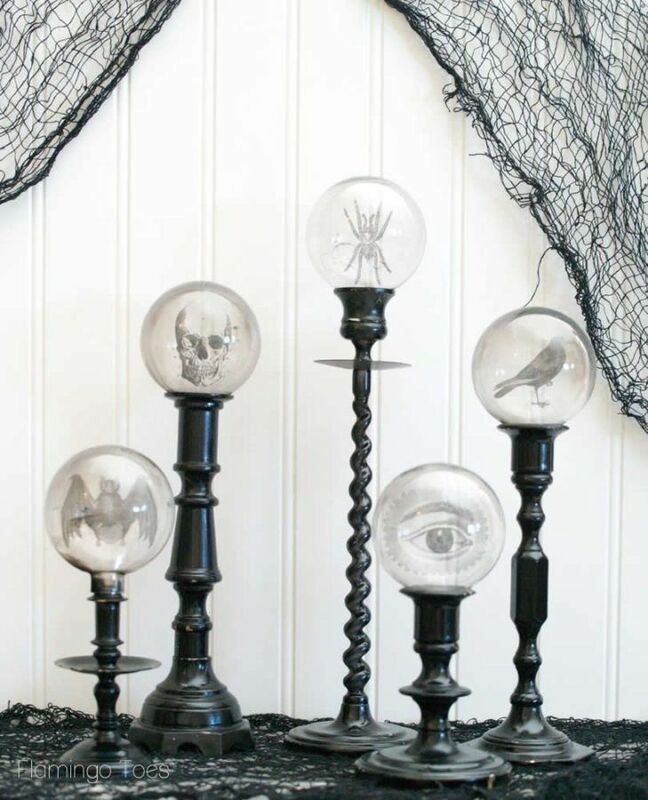 You can decorate your Halloween bar cart with lanterns, spiders and all sorts of other things. You might want to check out fashionablehostess for a few stylish ideas. 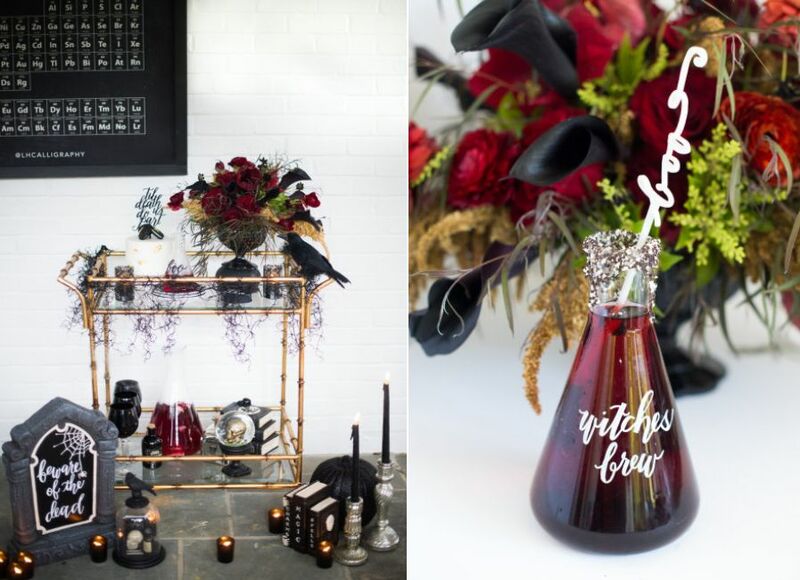 You can also find some elegant ideas on how to blend spooky and glamorous when decorating a Halloween bar cart on stylemepretty. You could have potion bottles, tiny cauldron glasses and a bunch of other chic accessories and decorations. 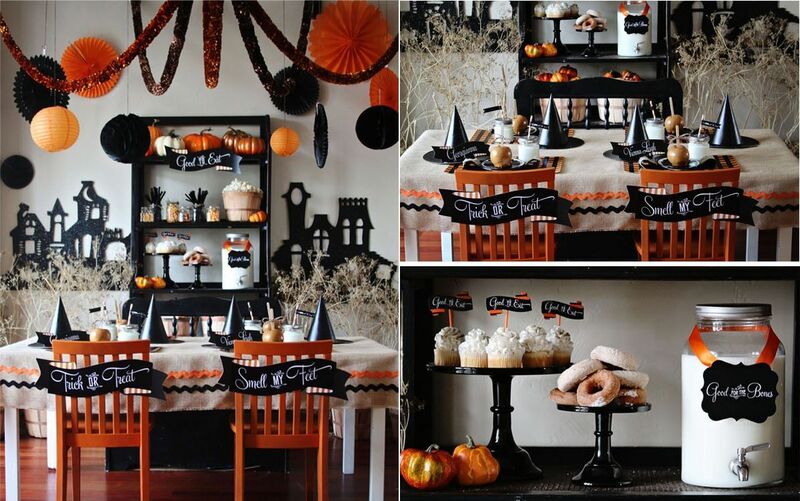 You can create a beautiful Halloween party decor without even using any of the classic symbols. 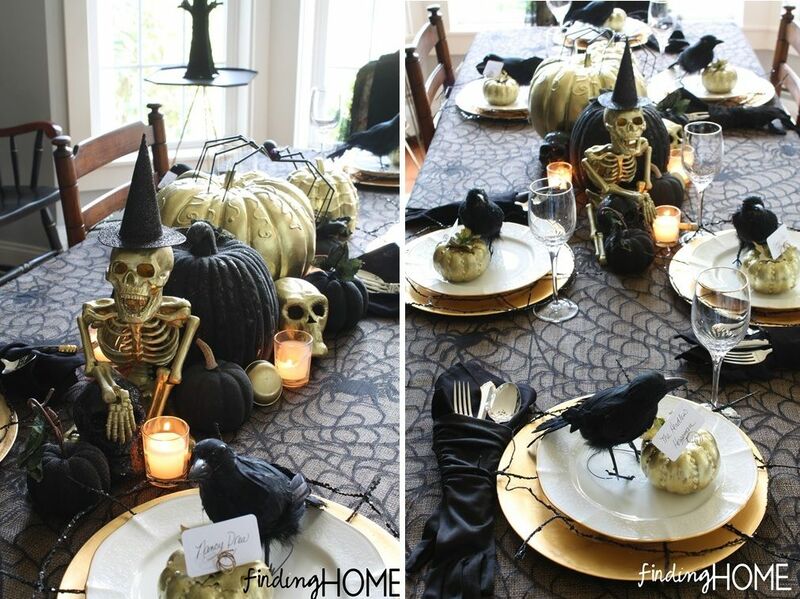 In fact, don’t use any creepy or spooky decorations but focus on dark colors and dramatic lighting. 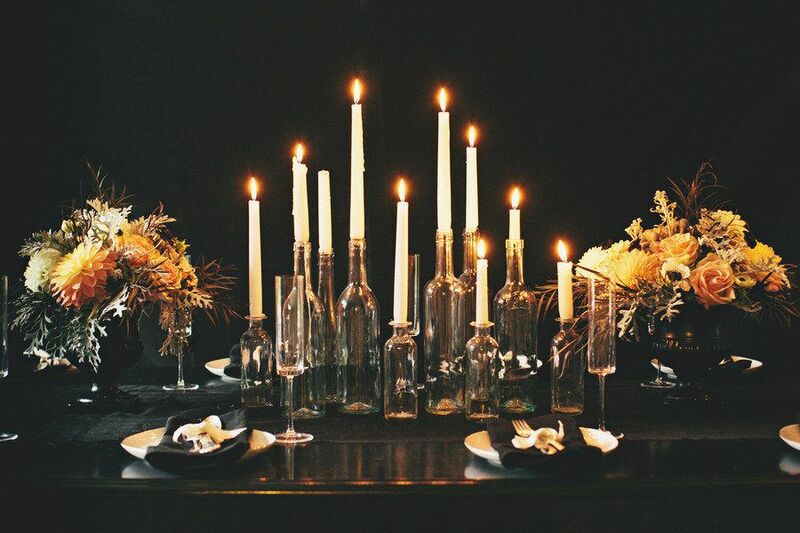 You could turn a bunch of glass bottles into candleholders, as suggested on stylemepretty. Speaking of dramatic lighting, check out this stylish marquee chandelier featured on heidiswapp. 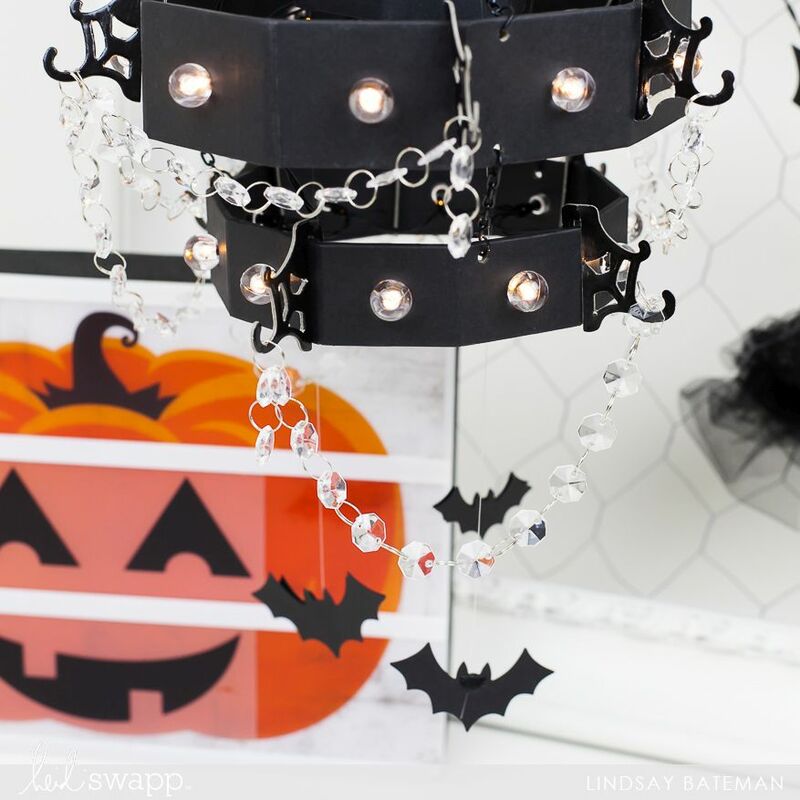 It’s part spooky and part glamorous and you can either make the whole thing from scratch or just give an existing chandelier a makeover. Pinatas are pretty fun, especially if you have kids and Halloween is about candy so, when you think about it, a Halloween pinata makes a lot of sense. It would have to look a bit spooky so you could use symbols like ghosts or a wicked witch’s hat. 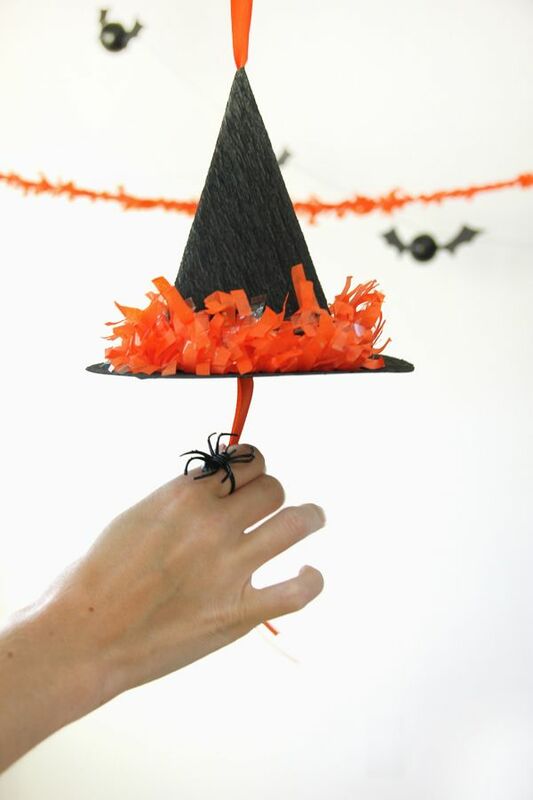 You can find out how to make a witch hat pinata from the tutorial featured on studiodiy. Here’s something we haven’t seen in a while: a crystal ball. Actually, these are not crystal balls per se but they’re pretty close and they’re quite easy to make too. This is what you need, according to flamingotoes: transparency film, clear Christmas ball ornaments, a hot glue gun, candlesticks and candles. 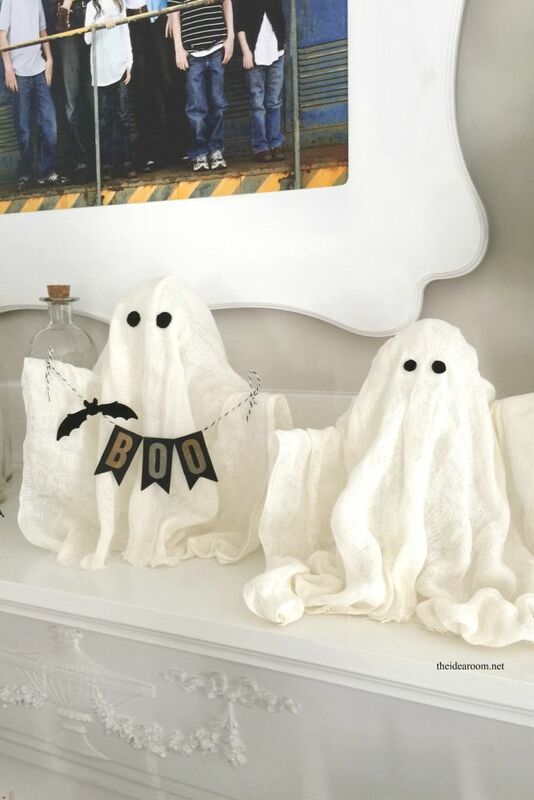 Aren’t these ghosts adorable? They stand up on their own and they’re fun and relatively easy to make. You need cheesecloth, liquid starch, small balloons, mason jars and pipe cleaners. They’d look awesome on the fireplace mantel, on shelves or on your desk. Check out theidearoom for more details. 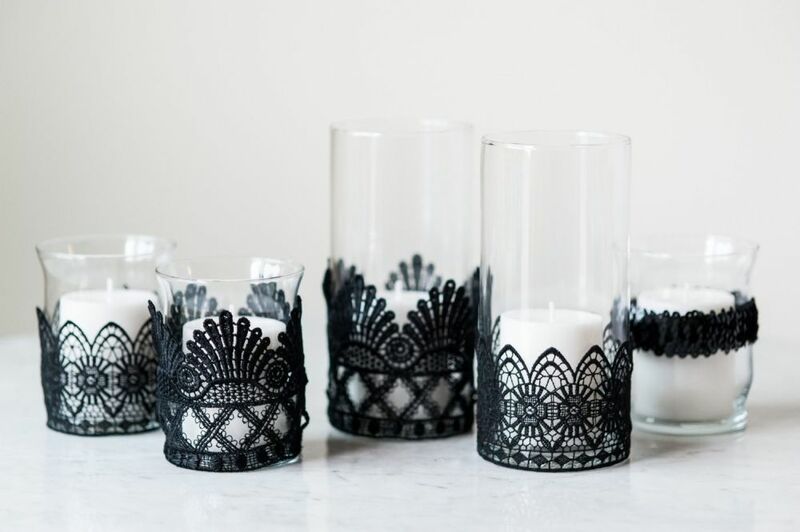 You can easily turn regular, plain glass candle votives into Halloween decorations by decorating them with black lace. You could also do the same thing for a simple vase. All you need is some lace, maybe some sequin trim also, a hot glue gun and clear candle holders. Of course, some candles are needed as well. You can find instructions for this project on thesweetestoccasion. Turn your Halloween dinner table into a mad scientist’s lab desk. The drinks could look like potions and you could put them in jars and you could also make custom labels. 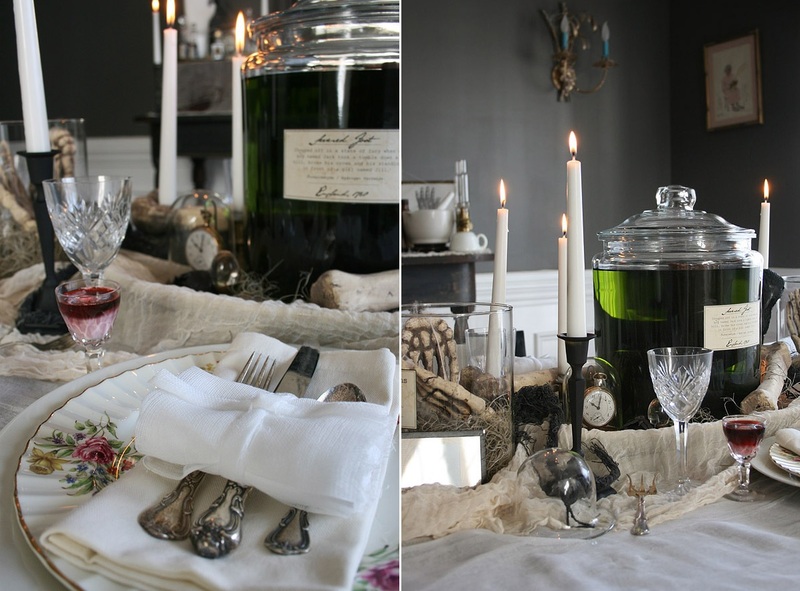 It might also be fun to add a creepy, dusty look with spider web ornaments and a custom cheesecloth runner. Find more inspiring ideas on thehappyheathen. Mantels are always the subject of customization whenever a special occasion arises. 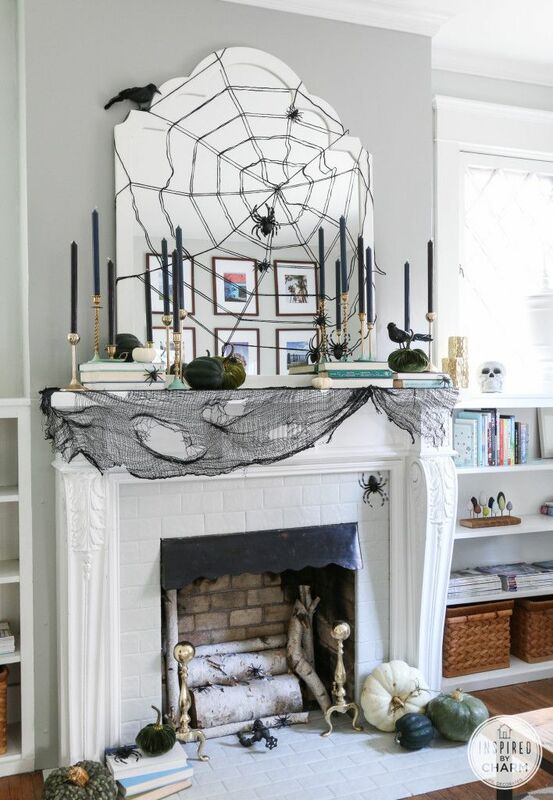 You can prep it for Halloween by filling it with DIY decorations and themed ornaments like spider webs, painted pumpkins and lanterns, candles and all sorts of other things. Check out inspiredbycharm for more details. As you can see, there are a lot of different ideas when it comes to Halloween party decorations, many of which we haven’t even mentioned yet. 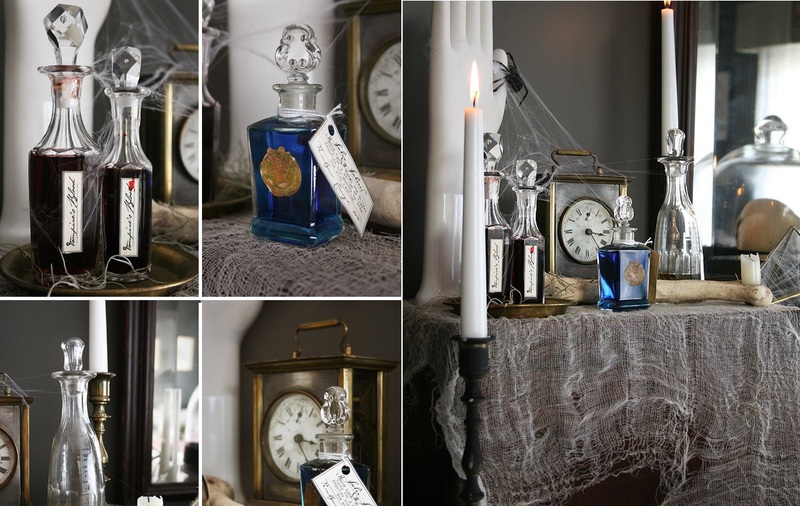 Some projects like one featured on loraleelewis don’t really focus on a specific theme but rather on the whole Halloween party decor. The color palette is nice and there are a lot of little details which make this setup a big success. There are also a lot of printable Halloween decorations which can make your party awesome, things like custom labels, wrappers and tags. You can find a big collection of Halloween printables on thetomkatstudio. It includes everything you need for a successful spooky party. Black is by far the most popular Halloween color. You can combine it with pretty much any other color to create interesting and eye-catching contrasts. A particularly nice combo is black and gold. It’s dramatic and spooky with a touch of glamour. The inspiration comes from findinghomefarms. A custom table runner can potentially help set apart your Halloween party decor from other more common ones. 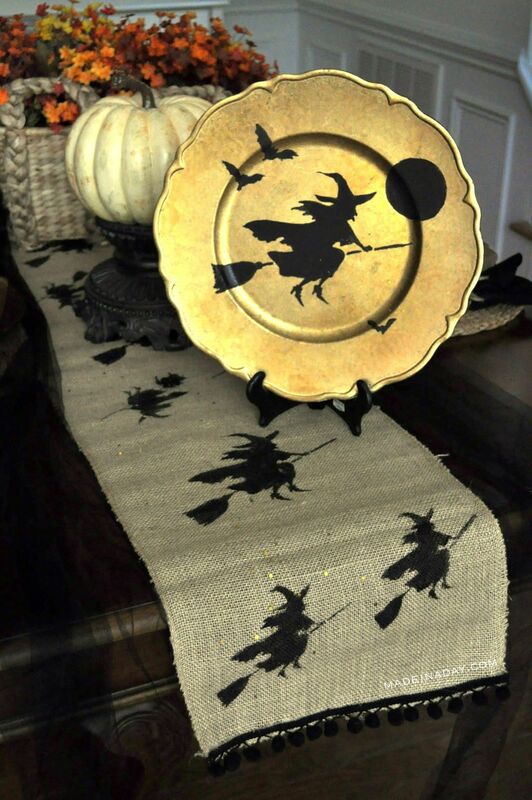 You could use a stencil to paint witch silhouettes on a basic table runner (a burlap one would look nice) and you can actually also use that stencil to decorate a few other things like the plate chargers. Find more details about these DIY Halloween decorations on madeinaday. Just because it’s a Halloween party doesn’t mean it has to be dark, gloomy and sad. 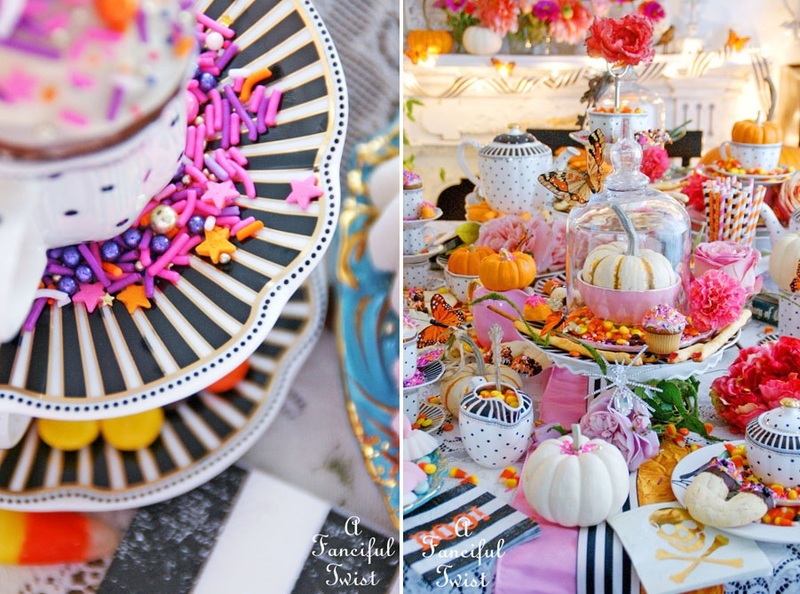 If you prefer a more colorful approach, try a cheerful party decor like the one featured on afancifultwist. You can use all the spooky Halloween symbols you can think of but make them look colorful for a fun twist. 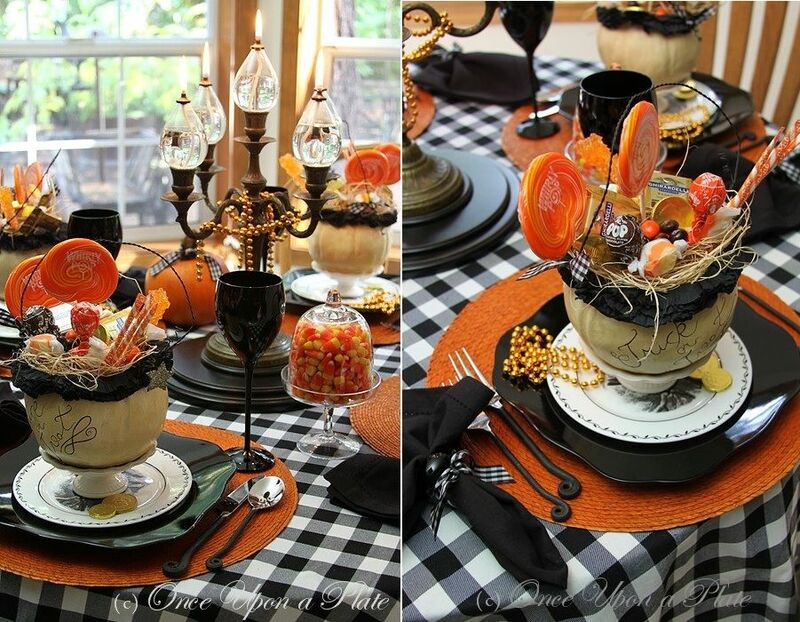 A black and orange Halloween party decor could also look nice. In fact, it could look quite elegant if it’s anything like what we found on onceuponaplate. We really like the combination of different textures and finishes and also the checkered tablecloth. 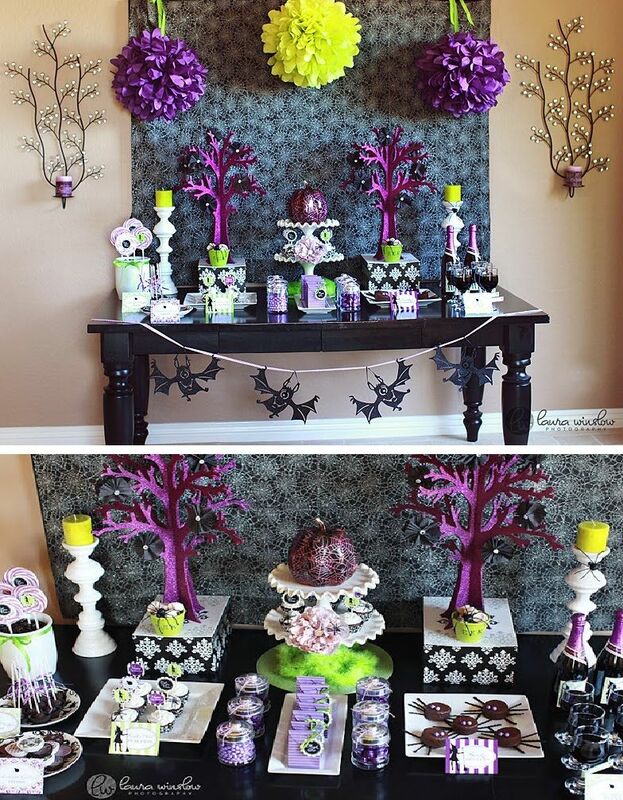 Similarly, a black and white Halloween party decor could look awesome too. 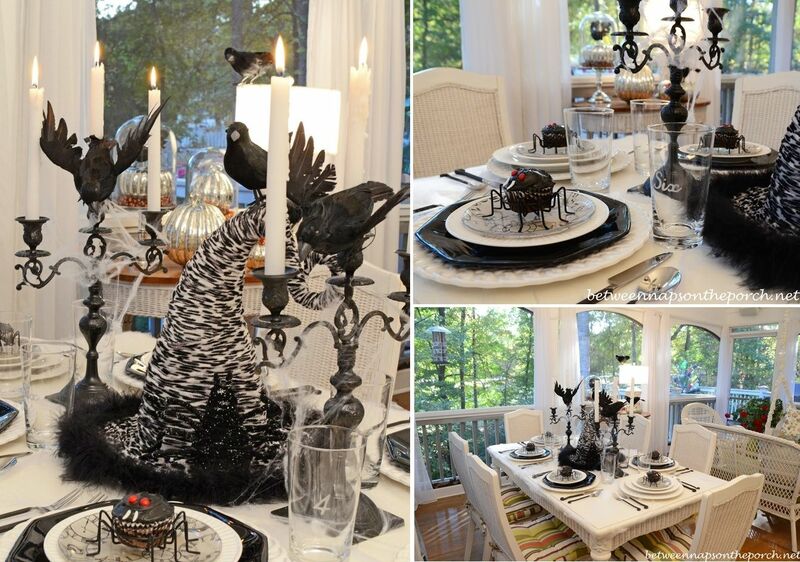 You can decorate the table with spiders, bats, crows and other black symbols you can think of and you can use a mixture or black and white plates and glasses. You can find more inspiration on betweenapsontheporch. Previous PostPrevious Baby Boomers are Downsizing, Are You Ready to Move?